A car organizer that your best friend can call their very own! Stores everything needed for a walk in the park, car vacation, hike up a hillside or romp on the beach. Main compartment on the back seat organizer has a spring-frame closure to keep prying paws from getting inside. 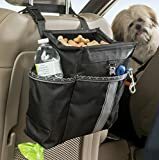 3 outside pockets hold dog treats, toys, bottles, bowls and accessories. And a built-in poo bag dispenser insures a doggie doo is never a doggie don’t. Patented.